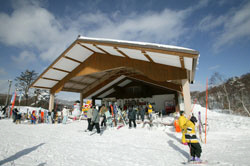 Madarao Mountain Resort (known as Madarao Kogen in Japanese) is located in the north-eastern part of Nagano Prefecture. Well known as offering some excellent powder snow conditions in season and a good selection of official tree runs, Madarao Kogen offers a good choice of courses suitable for beginners to more advanced snow riders. At Madarao, 60% of the courses are ungroomed, so there’s a good chance that you’ll be able to enjoy a fluffy, deep powder when you ski. Also, since not as many people as you might think like to ski on untouched powder, there is not a lot of competition for the slopes! Mt. Madarao stands 1382 meters tall and has 30 separate courses. There are 15 ski lifts at the resort. The ski area features a unique bowl-shape. 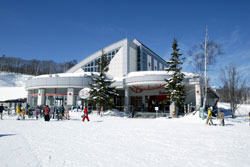 Since Madarao was host to Japan’s first Freestyle Skiing Competition, there are many unique courses to choose from. There are groomed courses, ungroomed courses, the Tree Run courses, Free Ride Park, Kid’s Park, and wave courses - Madarao can be enjoyed by everyone from first timers to advanced skiers! Further, at the top Madarao is connected to the Tangram Ski Circus ski hill and a joint ticket is available to let you ski or snowboard on the slopes of both ski resorts. 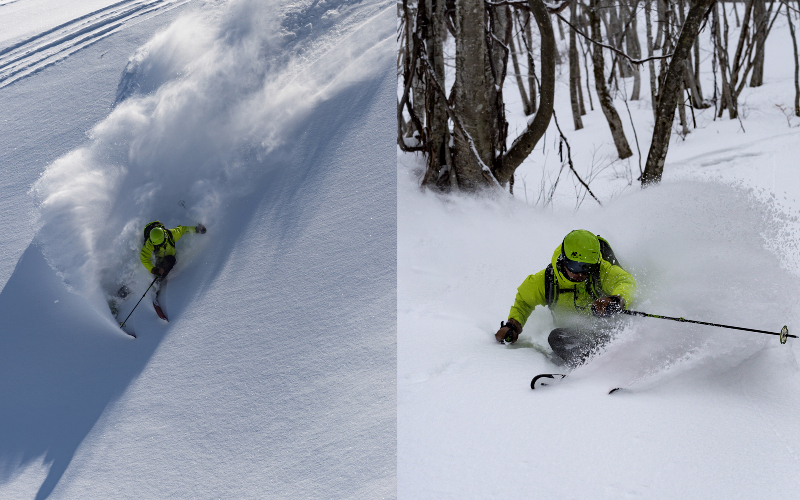 For full information on the current line up of courses at Madarao Kogen, check the official website info here. Along with POWDERWAVE is our brand new course POWDERWAVE II. Both courses take advantage of the natural landscape to create a unique and challenging course. Given the irregularities of the natural landscape, these are technical courses geared toward experienced skiers. Whether you are in the mood for a powder run, are looking for some natural hits, or want to enjoy an air session, this is the course for all you advanced skiers out there. POWDERWAVE II can be accessed by way of Tangram Lift 2. River Line is a V-shaped course filled with the remains of rivers, making long pathways in the snow which can be “surfed” like waves! This course takes advantage of the natural landscape to provide a challenging and technical course for advanced skiers. River Line will be open on an on-and-off basis depending on weather conditions - if it is closed, there will be a “closed” sign placed at the entrance. Under no circumstances may guests enter River Line if it is closed. Another course is the popular tree-run course, Rabbit. You'll feel just like a rabbit (usagi), zipping through the trees. Definitely worth trying your skills at if you consider yourself an advanced skier! What is Round in classic ski area tour? The owners of lodges in Madarao Kogen are happy to introduce you to an exciting tour. On this tour, you can stay in Madarao Kogen and enjoy skiing and snowboarding in Madarao -- as well as a selection of other famous nearby classic ski and snowboard areas, such as Nozawa Onsen, and the resorts in Myoko Kogen and Shiga Kogen. 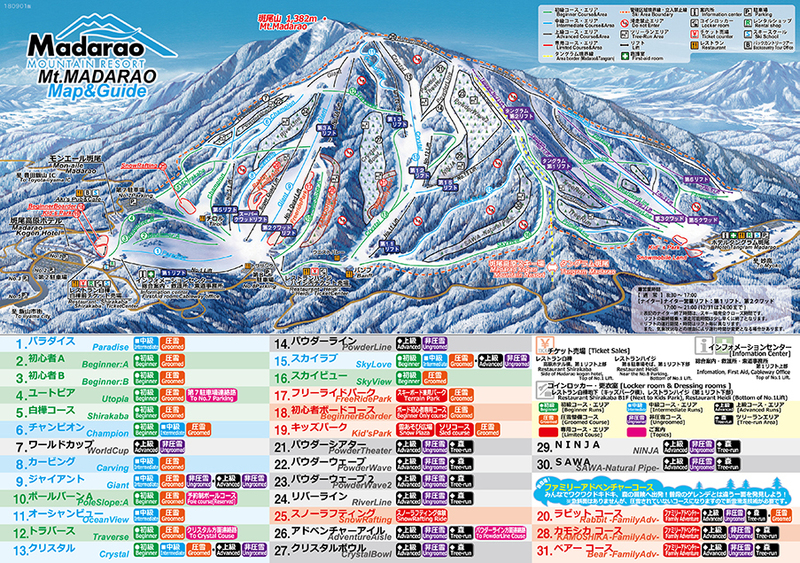 Madarao Kogen is geographically located in the center of these famous classic ski areas. From Madarao Kogen, it takes less than forty minutes to Nozawa Onsen and Myoko Kogen, and just sixty minutes to Shiga Kogen.... Madarao Kogen makes for a great base-camp to go to these other classic ski areas. Found in the central area, Restaurant Heidi is the main restaurant of the resort. In addition to a sit-down area for restaurant eating, there is also a drink counter, snack shop, ski/snowboarding goods shop and a crepe shop. Be sure to try the Thai Style Gapao Rice or popular Jumbo Sausage Hot Dog. Next to the Kids Park, Restaurant Tyrol has a kids room and other child services available. Suitable for families. 9am-4pm. 150 seats. 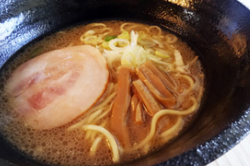 The BIG (HAM)Burger is popular, as well as Miyuki Pork Stew and Nagano Pizza. 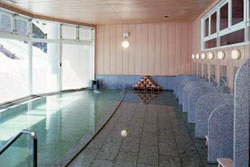 Madarao Kogen Onsen is a natural onsen inside the Madarao Kogen Hotel at the entrance to the resort. Great to relax and recharge. 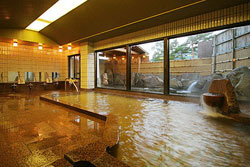 People not staying at the hotel can also use this onsen. Opening times are 7am-10am & 12pm-10pm. Adults: 800 yen. Children: 500 yen. Includes facetowal. Madarao no Yu. This can be found 5 minutes on the way back down to Toyota. Good place to pick up some souvenirs too. Opening times are 10am-8pm (closed on Tuesdays). Adults: 500 yen. Children: 350 yen. There are two kinds of lift ticket passes on sale - those that are valid for Madarao Kogen only and also a joint ticket that allows you to ski or snowboard at both Madarao Kogen and the connecting Tangram Ski Circus resort. A wide range of skiing and snowboarding equipment is available for rental at the resort. Backcountry tours are aimed toward enjoying the natural landscape of Mt. Madarao through skiing and snowboarding. There are several paths leading up the mountain and hiking up to the top takes around 20 minutes - perfect for beginners. Please ask the resort for more details. The Madarao Kids Park is popular with children - and also their parents! It is set up on a regular ski run but also has lots of fun stuff like sleds, snow tubes and a Japanese style igloo for the kids to enjoy. There is also a 'snow fun corner' where anybody can have fun in the snow regardless of age or ability. The entry fee of 500 yen per person includes kids park admission and use of the special snow escalator, making it easy for even small children to move around. The Sky House ('Sora-no-ie') Kids Room is available free of charge and is located close to the park. Sleds are available to rent for 800 yen per day. At the entrance of the ski resort - inside the Madarao Kogen Hotel - is the Tsumiko no Heya child care facility where you can leave children older than one year old. * Open from 9:00am until 12:00pm and from 1.30pm until 4.30pm. * Costs are 3,000 yen for a half day; 5,000 yen for a full day. * Children older than one year old only. For current conditions, please see the Madarao website (in Japanese) or the weather report on SnowJapan. Madarao is located in the north eastern part of Nagano Prefecture, on the border with Niigata Prefecture. It is just an hour or so from central Nagano City and is part of Iiyama City. The Hokuriku Shinkansen bullet train stops at Iiyama Station, just 30 minutes away from Madarao Kogen. Travel time is approximately 111 minutes with frequent departures throughout the day. A direct bus connects Iiyama Station with the resort and costs 500-700 yen for adults and 250-350 yen for children, depending on the time of the service. 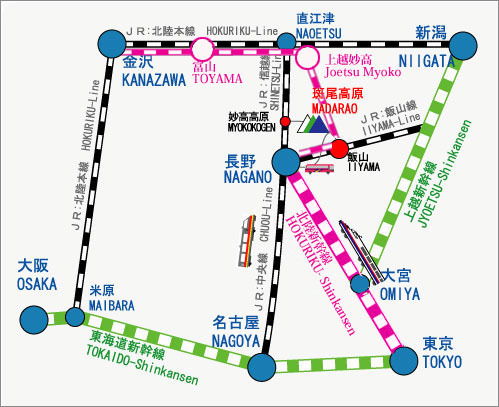 From Nagoya, take the Chuo limited express (Shinano) from Nagoya Station which travels to Nagano via Matsumoto. Travel time is approximately 3 and a half hours. From Osaka, take the Thunder Bird to Kanazawa and then transfer to the Hokuriku Shinkansen direct from Kanzawa Station to Iiyama Station. Travel time is approximately 4 hours. Take the Chuo Expressway to the Okaya JCT and then head towards and past Nagano city on the Nagano Expressway and then continue on the Joshinetsu Expressway until the Toyama Iiyama IC. Alternatively, take the Kanetsu Expressway to Fujioka JCT and then turn onto the Joshinetsu Expressway towards and past Nagano city until the Toyama Iiyama IC. Exit at the Toyota Iiyama IC and follow Route 117 and signs to Madarao Kogen. Take the Chuo Expressway to the Okaya JCT and head towards and past Nagano City on the Nagano Expressway and then continue on the Joshinetsu Expressway until the Toyama Iiyama IC. Take the Meishin Expressway to the Komaki JCT, then head on the Chuo Expressway to the Okaya JCT and head towards and past Nagano city on the Nagano Expressway and then continue on the Joshinetsu Expressway until the Toyama Iiyama IC. Exit at the Toyota-iiyama Interchange and follow Route 117 to Madarao Kogen. Travel time is approximately 5.5 hours. Both the Myoko Kogen resorts in neighbouring Niigata Prefecture, and Nozawa Onsen and Shiga Kogen resorts in Nagano are within easy reach from Madarao Kogen.